I’m a competitive person. A few years ago I would have added the word “very” in front of competitive; I’ve mellowed as I’ve aged but I remember the lengths I went to in order to be the best at whatever I deemed important. I’m fairly certain I would not go to such lengths to win a memory competition. 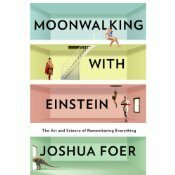 Joshua Foer thought it was a dandy idea…..
Joshua found himself in the world of competitive memory when he decided he wanted to do a journalistic book about the subject and the people in it. Apparently, and I didn’t know this, there is a world competition for memory. These people memorize long lists of numbers, decks on top of decks of cards, poetry….ect, all to repeat what they remember to some judges in hopes of winning. My question was why? What purpose could this possibly serve? Who needs a skill like this and when would one have the need to memorize 20 decks of cards? As the author points out in the book, we no longer need to remember much of anything these days, all our electronic gadgets serve as our external memory. When was the last time you memorized a phone number? Pretty close to “a really flippin long time ago” I would guess. To accomplish the mind boggling feet of, say, memorizing the order of cards in many set of cards in just minutes, they use the technique called mnemonics. What this is, is making a visual backdrop for each card, or number, or object and putting them in ‘memorable’ situations doing strange things……and apparently the raunchier the better. Trust me you don’t want to know what his mind had conjured up for Bill Clinton and a Watermelon, but I will never forget it. Competition got the better of Foer, and he went from writing a book about memory competitors to being a competitor himself. He wanted the American memory championship bad! So bad he resorted to wearing blacked out goggles with small holes in them to see whatever he studying and to wearing earmuffs to minimize distractions.